This project is one of my biggest ever. And yet it's one that I've heard my husband say he would be willing to do with me again. 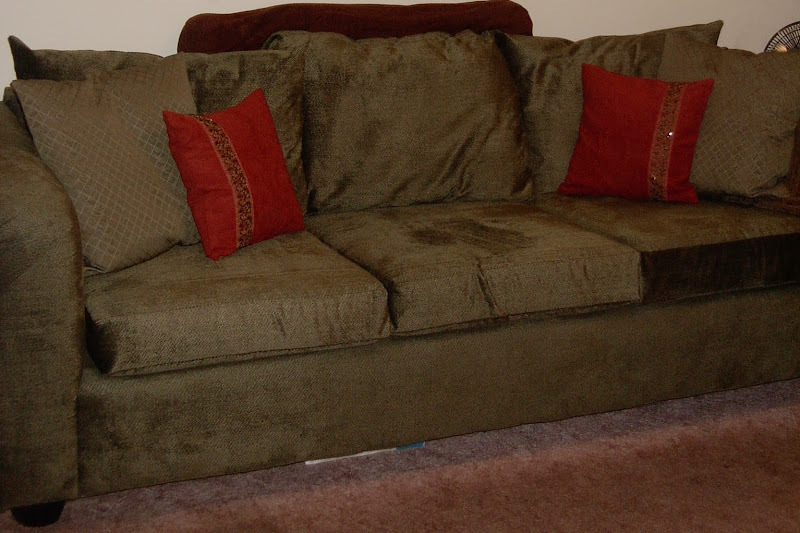 When we got married we bought an old sofa and love seat. Together they cost $100. We could not afford more than that. But - they were hideous. 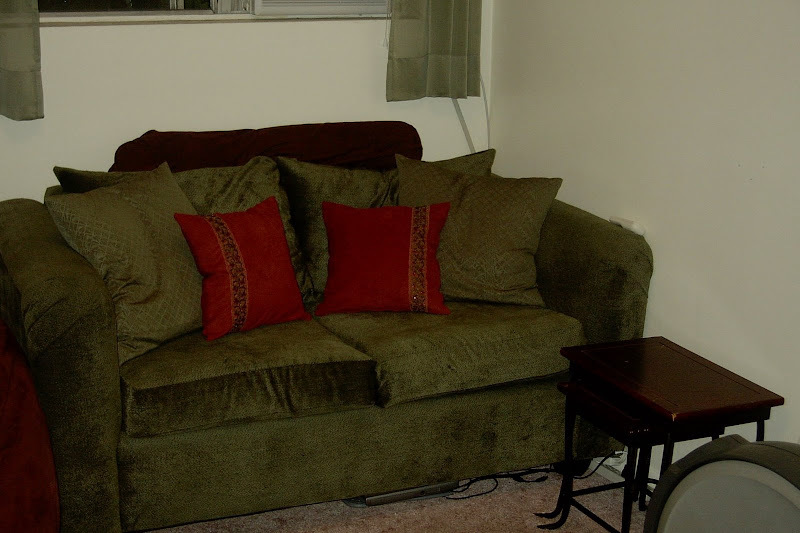 This is the couch in it's former shape! I'm not sure what the pattern was called in it's glory days - but to us it was Pastel Tex-Mex. We didn't waste time finding cheap slip-covers. I also found some cute napkins and sewed pillow covers for some cute decor. But alas, as those of you with slip covers know - they are terrible to deal with. (At least, the unfitted kind are.) I was constantly stuffing the fabric back into place, pulling on it, smoothing it out. It was like sitting on your bed right after you finished making it. And it drove me mad. Mad enough to consider Re-Upholstery. Most people say you should only reupholster something if it's vintage or sentimental because it's too much work or too expensive. These couches were neither. I just didn't have money for new couches. But I had enough for some discount Upholstery! So I decided to give it a try. A trip to a local Home Fabric shop and I found some really nice green upholstery fabric for $3/yard! I bought the rough estimate amount using some online calculator to tell me about how much I needed. I think it was 27 yards. I know with taxes it was just under $100. I made another trip to the BYU's library and checked out about 7 books on upholstery projects. During one of our road trips to Canada I read the books, narrowing down the pile of useful aides to about 2 books. I learned as much as I could from those books. Then one day when classes were cancelled and I didn't feel like studying I grabbed the tools and started demolition. I pulled those couches apart (1 at a time) as fast as I could. The worst part was pulling out the old staples. My hands were so sore. My wonderful husband helped when he came home, and he helped with the next couch. Bless his heart for putting up with all my craziness. 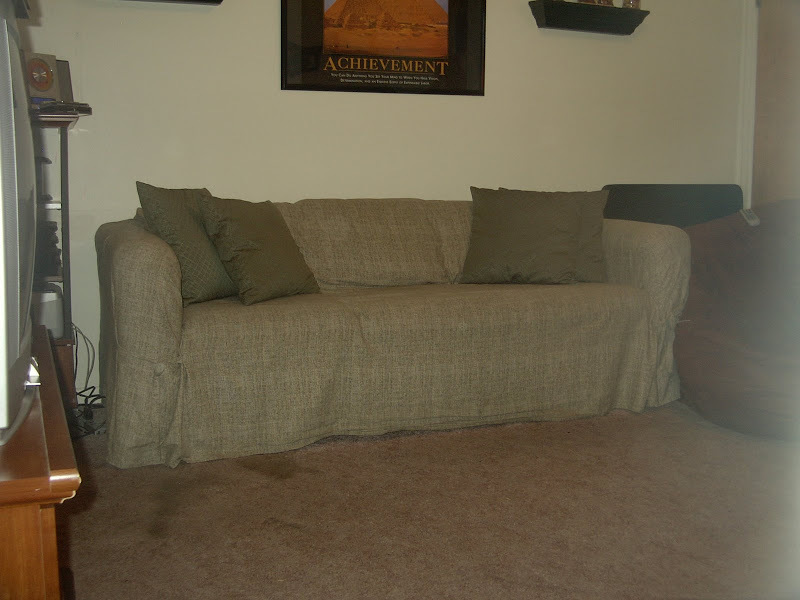 While I had the couch completely apart, I re-enforced the back with Jute Webbing so that it would have extra support. This has been especially handy when the back cushions are off! 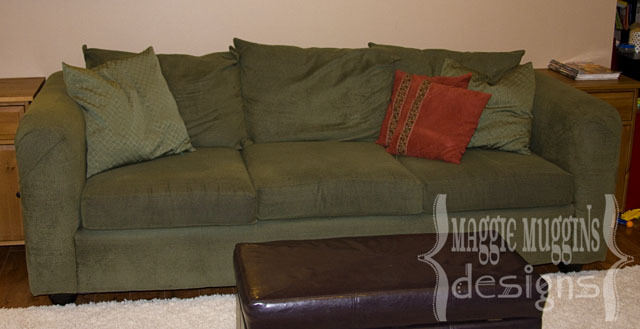 I used the old fabric pieces as patterns for the new fabric and began re-forming the couches. I changed the pattern on the cushions though. They were very rounded and I wanted straighter lines. I can't even begin to describe the difference the new fabric made so I will show you instead. All together the re-upholstery cost $150. I bought new legs later (the nice bun feet style) and painted them black. Another $80. Anyone else out there amazed by how much those things cost? And that was a really good price! A few months after we finished my hubby and I saw a sofa like these at Pier 1 for $800 - just the sofa! Oh yeah - talk about saving $$$! Later, after all was said and done I found more napkins and made the red pillow covers. I also found the lace to put on them at Jo-Anns. I still can't believe how well they turned out for a first timer. I'm adding a little update for the CSI Project folks. Just in case anyone gets ideas from this. It's been about 3 years since I worked on these so do I have any regrets? Yes. 1. I wish I'd replaced some of the tack strip instead of using the old. It comes loose every once in a while and annoys me. 2. The lace on the red pillows. During a game once my husband was asked to describe one thing that his wife made that he didn't like. I believe he described these as "the bane of his existence". Ouch. It's actually because of the beads on the lace. Very Scratchy and annoying when you actually use them. I've bought new Joel Dewberry fabric to recover all the pillows. Pillows are decor but they should be comfortable too! I can say I'm still pleased with the look, the color, and the overall durability of the fabric. We've had to wash the cushion covers many times so I'm really glad that I put zippers on all the covers. So much easier. We machine wash our covers and hang them to dry. Wondering how it looks today? Here's a picture from this morning. You may think it's faded, but not really. This was just taken in different lighting and with a different camera. We had the exact same couch as you guys, I think. It was a hand-me-down from Rusty's parents when we married, and my not-so-talented self just finally bought another to replace it a few years ago. No re-upholstering for me. That's a great talent you have, it looks great! !